The only real solution to reducing violence is reducing inequality. 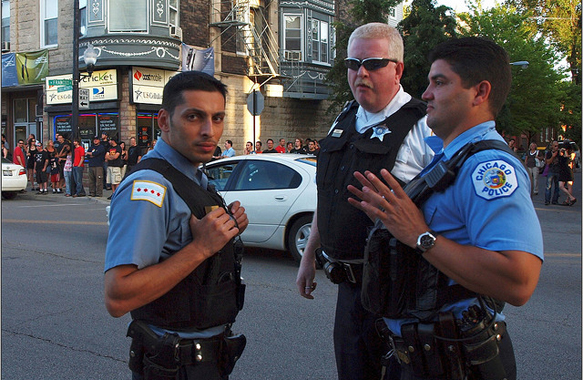 For decades, every Chicago mayoral election has featured calls more for hiring more cops. Emanuel and Daley of course got in on the act, but the most popular non-machine contenders are calling for the same thing. When she was a prospective candidate, Karen Lewis repeated the now-familiar mantra, as did Bob Fioretti, and after vacillating with vague mumbling about “community policing,” so now, too, has Jesús “Chuy” García. But does Chicago have a dearth of cops compared to other cities? And more to the point, would more cops do anything to stem our civilian-on-civilian violence rate, let alone address the anger over police violence expressed in the continuing protests over the killings of Michael Brown, Eric Garner, and several local victims? Listening to the candidates, you would think that Chicago has a dearth of cops compared to places like New York, which had 79 fewer murders in 2013 despite having more than three times our population, or Los Angeles, which had 163 fewer murders despite having a million more people. 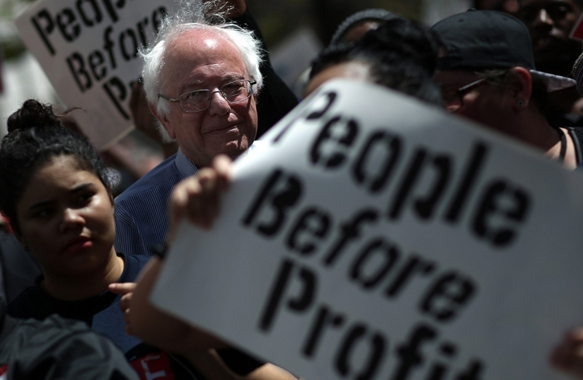 If we are going to take down 'Mayor 1%,' we need opposition candidates worthy of the name. If we're going to put in the shoe leather necessary to offset Rahm's 10-to-1 fundraising advantage, we deserve genuine opposition candidates who reject the tired 'hire more cops' claptrap, and instead promote programs that would actually curb violence. You can't do both. But in fact, according to the FBI, Chicago has the third highest cop per civilian ratio in the country. And when extraneous factors are factored in, like the presence of the federal government officers, Chicago arguably has the highest number of municipal cops per civilian of any city in the country. According to the F.B.I.’s 2012 Uniform Crime Reporting Program, which counted officer / civilian ratios in every municipality of over 50,000 people, Chicago ranked #3 in the nation behind only Washington, DC (8th highest murder rate in 2012) and Baltimore (fifth highest murder rate). The cities of 250,000 or more with the lowest murder rates in 2012 also had some of the lowest cop per civilian ratios—#1, Plano, Texas (cop per civilian ratio, ranked #514 out of a total 697 cities); #2, Lincoln, Nebraska (cop per civilian ratio, #522 out of 697); #3 Henderson, Nevada (#510 out of 697); #4 Mesa, Arizona (#292); Santa Ana, California (#643) and Portland, Oregon (#355). While Chicago is hardly the “murder capital” of the country, our violence rate does compare quite unfavorably to other large, relatively prosperous U.S. cities like New York and Los Angeles, and the U.S. violence rate is rightly notorious compared to other developed nations. So if hiring more cops bears little causal connection to, or even correlation with, stopping civilian-on-civilian violence, let alone ending police violence, how can we most effectively reduce Chicago’s violence? To figure this out, we need to move beyond the scare headlines and politicians’ bumper sticker promises. We also need to reject some canards commonly put out by community anti-violence activists. Besides the “hire more cops” solution offered by politicians and many community anti-violence activists, the other major prescription for ending the violence is gun control. This too has been a failure, and not just because guns can be imported across city boundaries and the courts have taken a broad interpretation of the 2nd Amendment. Internationally there is very little correlation between levels of gun possession and violence rates. Honduras, with by far the highest murder rate in the world—80.6% higher than the second place nation—is way down the list in per capita gun ownership at 88th in the world, tied with England/Wales and Bulgaria. On the other hand, high gun possession countries can have very low murder rates. In Switzerland, for example, owing to its 19th Century formation as a nation protected by armed militias, virtually all men between the ages of 18 and 42 have firearms in their homes. Yet Swiss murder rates are extremely low by world standards, similar to the quite low rates of other Western European nations where civilians have almost no access to guns. If Not More Cops & Gun Control, What Does Limit Violence? Regardless of policing strategy or number of cops, the fact is that the violent crime rate in most U.S. cities has been declining for several years. This probably has more to do with demographics than anything else—as our overall population ages, younger men are aging out of their more violence-prone years. Some studies also convincingly point to the deleterious effects of lead poisoning on young adult cognition, and its significant reduction over the past few decades, as a major factor in the diminishment of crime. Then there is the impact of the stunning, decades-long law enforcement failure to stamp out illegal drugs. Illegality serves to hike prices, and thus profit margins, prompting sellers to take ever more desperate, illegal and violent measures to collect those profits. Converse to this, we now have preliminary data suggesting lower violence in Denver due to the end of marijuana prohibition, as well as convincing historical data about the diminishment of violence caused by the ending alcohol prohibition during the Great Depression. But if these factors contribute to a decline in violence, what are the factors that promote it? There are two causes of human violence that probably trump all other factors: poverty, and a related (but not identical) cause, economic inequality. While even some left-wing writers dismiss economics as having any relation to violence, it doesn’t take a rocket scientist to see that the five most violent American cities (as measured by murder rate) with populations of at least 250,000 people—#1, Detroit; #2, New Orleans; #3 St. Louis; #4, Baltimore and #5, Newark are marked by stark impoverishment and inequality. 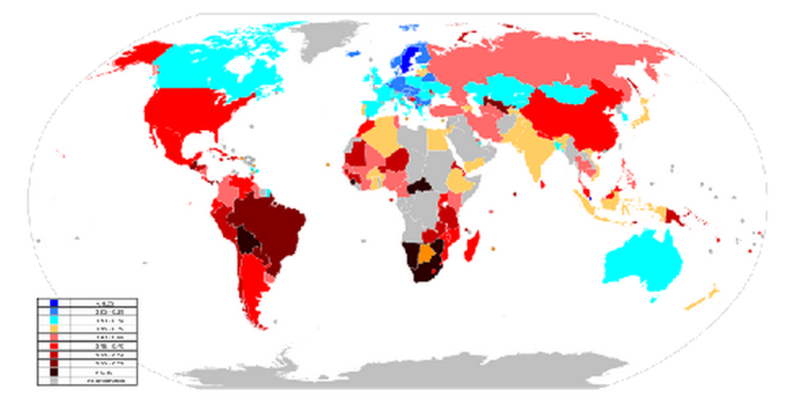 An unbiased look overseas shows a striking correlation between economic inequality and murder rates. While reporting agencies both here and abroad are notorious for fudging both poverty and crime statistics, the so-called “Gini Coefficient,” is internationally recognized as the best indicator of inequality. A United Nations’ calculation of the Gini Coefficient compares countries with the largest difference between their wealthiest 10% by income to their poorest 10%. It puts Honduras, with the world’s worst murder rate since a 2009 U.S.-supported coup, as the sixth worst for inequality out of 126 countries listed. 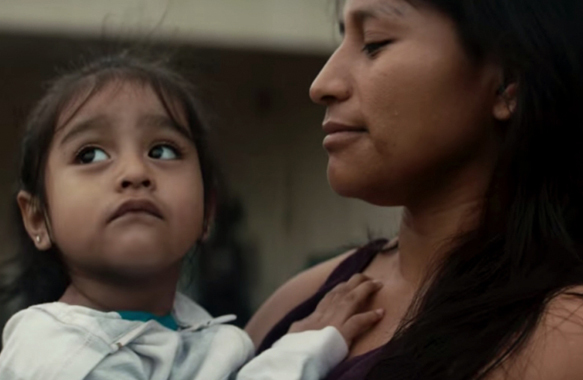 The World Bank’s listing of 156 countries by Gini co-efficient puts Honduras as eighth worst. Below is map rendering of Gini Coefficients based upon the 2009 CIA Factbook, and below that is a 2008 map of world murder rates. It’s striking how many countries with poor Gini Coefficients—Brazil, Guatemala and South Africa for example—also have some of the worst murder rates. It’s also striking how a country that’s culturally similar to the United States—Canada—scores much better than the U.S. in both regards. No doubt Gini Coefficient scores comparing the U.S. as a whole to cities like Detroit or New Orleans, or comparing communities like Wilmette to Chicago’s Englewood or K-Town neighborhoods, would also go a long way to explaining their different rates of violence. Unfortunately, as the maps below by Daniel Hertz show, Chicago’s mayor Rahm Emmanuel, his predecessor Richard Daley, and their corporate buddies have already done much to send Chicago in the wrong direction. Orange areas represent census tracks with the lowest median incomes compared with the overall Chicago median income. 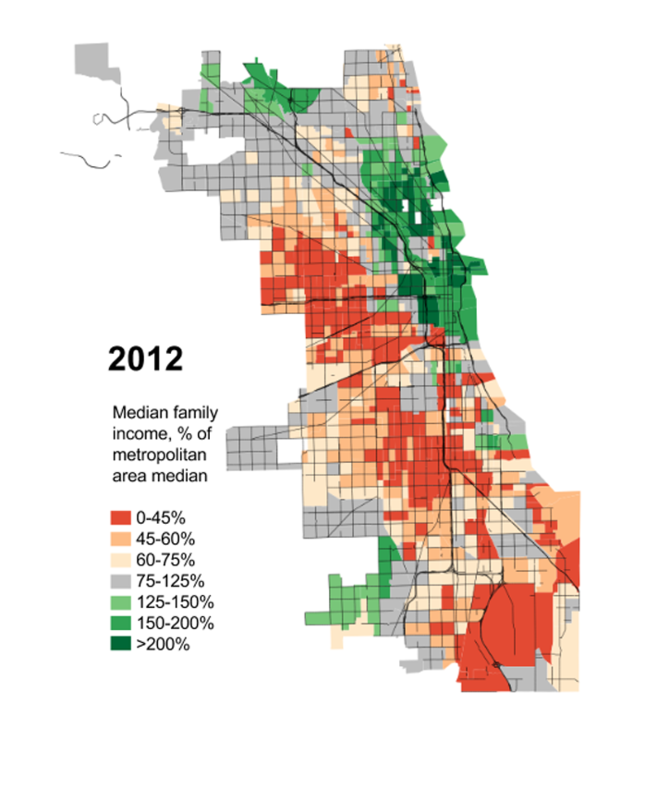 Dark green represents the wealthiest median incomes, with gray areas being about even with the Chicago median. 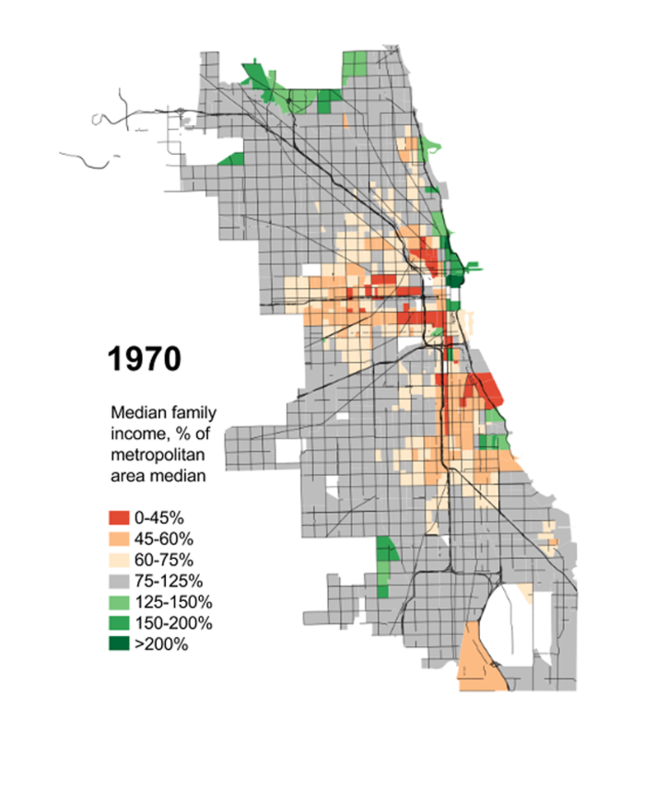 Comparing the 1970 map with the 2012 map, we see a huge erosion of the gray areas approximating the median, along with a dramatic growth of both the poorest and richest sections in the city. First, throw out the prescriptions offered by Mayor Emanuel and his leading challengers, Jesus “Chuy” Garcia and Bob Fioretti. If we are going to take down “Mayor 1%,” we need opposition candidates worthy of the name. If we’re going to put in the shoe leather necessary to offset Rahm’s 10-to-1 fundraising advantage, we deserve genuine opposition candidates who reject the tired “hire more cops” claptrap, and instead promote programs that would actually curb violence. You can’t do both. In a city already swimming in red ink, with prospects of even worse to come, wasting more money on an already bloated police force is worse than useless—it’s robbing money from programs that actually work. We live in a city with record high youth unemployment, which in turn feeds petty crime, which in turn feeds the prison-unemployment-prison spiral downwards. The legacy of the Great Recession and much of what animated the Occupy Movement were that 40- and 30-somethings traded down to jobs normally taken by recent college graduates, and college graduates took jobs previously taken by secondary school graduates or those still in school. Screwed most by this were black youth, followed by Latino youth—racism which is not only repugnant in its own right, but which bodes poorly for our majority-minority city. So first on the agenda to redress our Gini Coefficient/inequality problem should be massive investment by all levels of government to provide jobs and vocational training to youth. Germany, with one of the lowest violence rates in the world, is renowned for having world-leading vocational training programs for youth. In addition, a University of Chicago Crime Lab study published in the journal Science showed that participants in a Chicago youth summer jobs program “had 43 percent fewer violent-crime arrests over 16 months, compared to students in a control group,” reported Washington Post columnist Emily Badger. Second, funding for in-school and after-school programs and student-teacher ratios should be on the same scale as those found in Rahm’s home town of Wilmette. Such measures would have the added benefit of increasing socially-useful employment opportunities for working class Chicagoans. Third, the decades-long destruction of public housing, SROs and other low income housing must be dramatically reversed. While sons and daughters of upper middle class families can get by living in Mom and Dad’s basement, the income crash for working class youth and young adults over the past decade has led to doubling up in housing. Historically, immobility in housing choices has led to increases in domestic violence and other social ills. Finally, TIF funds should either be entirely wound up and given to the aforementioned programs, or spent on genuinely alleviating poverty rather than subsidizing wealthy mayoral friends. Emanuel’s and Daley’s spending of such “poverty funds” on such outrageous items as $5.2 million in tax dollars for a hotel for the Pritzker family’s Hyatt chain in Hyde Park, $55 million in tax dollars for a DePaul University basketball arena near McCormick (when the United Center offered its facilities rent-free), and $15 million in tax dollars for the rehab of the Chicago Board of Trade building for the dirt-poor Chicago Mercantile Exchange, are all moves calculated to send Chicago’s Gini Inequality Coefficient spinning wildly in the wrong direction. Levels of police violence track closely to inequality and violence as a whole in a society. Brazil for example, with a much worse Gini Coefficient than the U.S., is infamous for its police mowing down of youth. The role of the police in societies is to preserve the status quo. The more unequal the society, the more precarious the status quo; the more precarious the status quo, the more violence and intimidation required to maintain it. Where the Gini Coefficient is high, police violence typically is high. So aside from specific policy reforms, such as vigorous criminal prosecutions of police wrongdoing—and not just when protests demand it—the key to curbing police violence is building a more equal society. This fall and early winter has seen a spate of protests against police violence, here in Chicago and around the nation. All of Chicago’s front-running mayoral candidates, to their shame, have barely addressed the issue of Chicago police violence and racial discrimination. This is a disgrace in a city with as lurid a history of police racism, violence and prosecutorial misconduct as Chicago’s. It is a proverbial turning of the backs upon our city’s youth, particularly its black and Latino youth. Andy Thayer is an anti-war activist and co-founder of the Gay Liberation Network in Chicago. This piece was reprinted by EmpathyEducates with permission or license. We thank In These Times and the Author, Andy Thayer. We grateful for the research, the reality, and for the enduring vision.